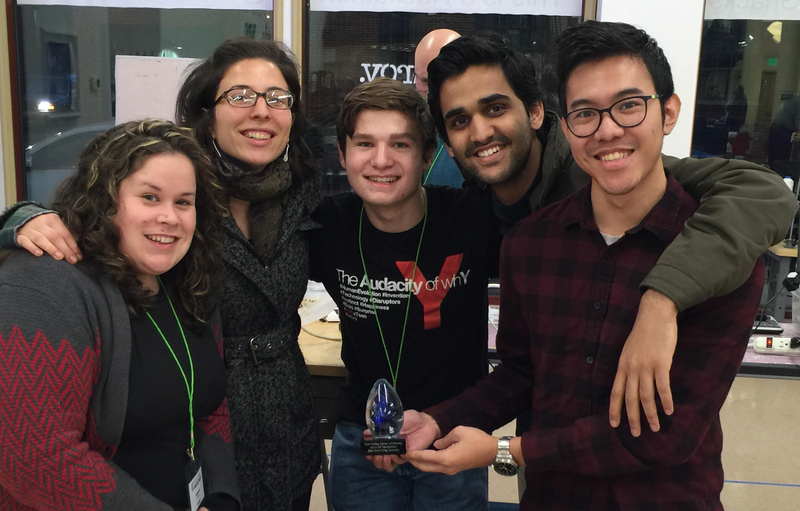 We put together a team for the Internet of Things Hackathon at Tech Valley Center of Gravity. Hackers were given 30 hours to conceive, design and build Internet of Things solutions. Arsal, Htoo Wai and Amanda(that’s me) showed up at 9am on Saturday, and we were quickly joined by a few stray hackers, Gabi and Finn. Together we spent 3 long hours brainstorming. Finally Gabi threw out an idea we could all get behind, and it grew. Networked noise level monitors were the concept, Noisy or Nice would be the name. The devices were built using esp8266s, elecret mic sensors and a lamp stack on a raspberry pi. As we worked on the project, mentors came around to talk to us about it. Word quickly spread about Noisy or Nice, and someone brought Troy Mayor Patrick Madden over to talk to us. He talked about an old system put in place in Troy, that detected loud sounds in order to triangulate the location of gun shots in the city. He said they did away with the system because it was cost prohibitive and not so accurate, but put pressure on us to build something better. Great idea, but let’s get the basics up and running first! We ran into problems with our sound sensor, we were receiving sound frequencies, but not necessarily amplitude readings. So Robert Hirsch, Engineer, Steampunk enthusiast and all around awesome Maker, gave us a few pointers on how to get the info we needed out of our sensor. Within a few minutes everything was back on track. The basics were working, and we all decided a good night’s sleep was in order. Roughly 10am the next morning we got back to work and started finalizing the basics of this device. The clock ticked away, and as the deadline approached, we all wanted more from our devices. Every team in the place was scrambling with last minute adjustments, troubleshooting and add-ons. 2pm hit, and the judging started. 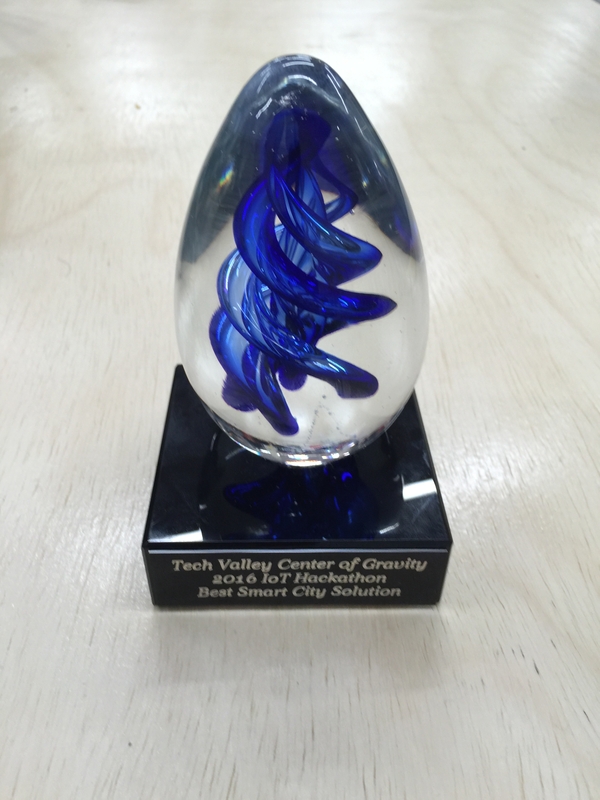 We took home Best Smart City Solution presented by Kishor Bagul, former CTO of NYS and founder of Cloud and Things. Our competitors were engineers from GE Research, a team from IPS based in Seattle, and many independent developers.